If you haven’t seen Mad Max: Fury Road yet, you should. It’s good. I mean, seriously, it’s really good. At any rate, it’s better than a film about spiky death cars has any right to be. Seriously, though, the cinematography is superb. The film’s editing guides the audience’s eyes, tracing a clear path through the maelstrom of explosions, gunshots, dust clouds, and Tom Hardy’s scowls. 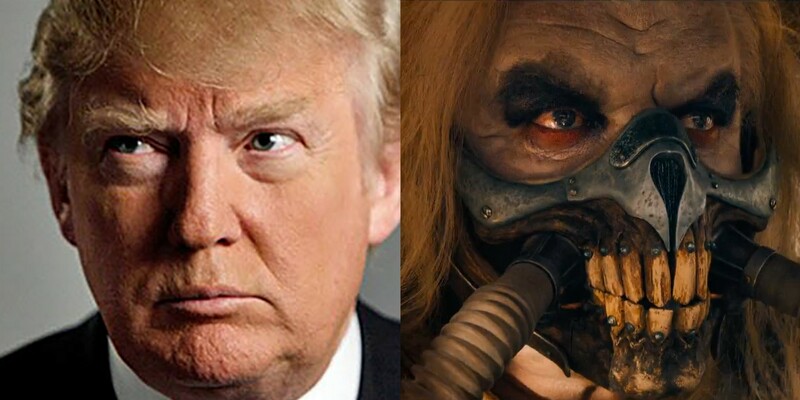 Incidentally, I still wonder whether the film’s villain, Immortan Joe, is secretly Donald Trump. It was a red-letter day when my brother and I trekked to our local movie theater to see this movie on a whim. Oh, what a day. What a lovely day! This entry was posted in Geeky Wednesdays and tagged storytelling by Adam Stück. Bookmark the permalink. Great movie. Shiny and chrome! I tried to watch it, but just couldn’t get into it. I think it might have been too “narrative minimalism” for me. That and a huge long sandstorm car chase thing with lots of explosions featuring characters I knew nothing about and didn’t actually care what happened to. It ended up being a lot of visual noise that just kind of made me dizzy and feeling sick. But I know a lot of people really loved it (clearly! ).